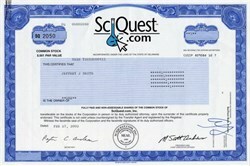 Beautiful certificate from the SciQuest.com Company printed in 2002. This historic document was printed by the American Bank Note Company and has an ornate border around it with a vignette of the company logo. This item has the printed signatures of the Company's President, and Secretary, and is over 11 years old. SciQuest provides a leading on-demand strategic procurement and supplier enablement solution that integrates customers with their suppliers to improve procurement of indirect goods and services. Their on-demand software enables organizations to realize the benefits of strategic procurement by identifying and establishing contracts with preferred suppliers, driving spend to those contracts and promoting process efficiencies through electronic transactions. 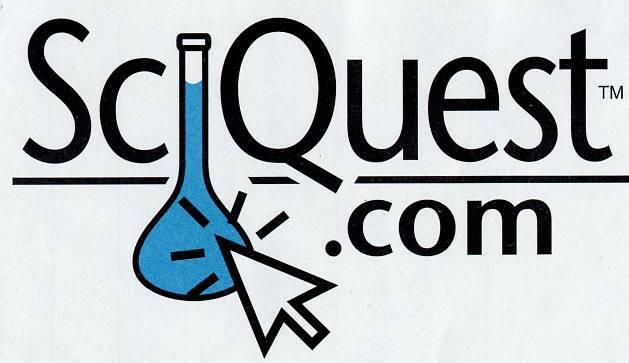 Using their managed SciQuest Supplier Network, their customers do business with more than 30,000 unique suppliers and spend billions of dollars annually.